Check out Alternative Rock on Amazon.com. Welcome to The Cobain Memorial, a web site dedicated to the life of Kurt Cobain. Kurt Cobain was the guitarist/vocalist/song writer of Nirvana. 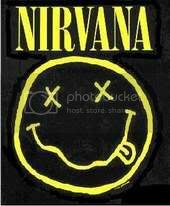 Nirvana broke into the Mainstream with their release of Nevermind which included Smells like teen spirit. About 3 years later Nirvana came to a halt when Kurt Cobain was found dead. He was 27. This web site is not about Kurt's tragic end, but his life. The 25th Anniversary of the Nevermind album was September 24th, 2016. If you would like to add our banner to your web site, here is the HTML. Thanks to anyone that adds our banner or gives us a text link. Want to be a friend of The Cobain Memorial on ?